Pálacio Itamaraty. All photos by Paula de la Cruz. When writer Paula de la Cruz last visited Brazil, she didn't go for the beaches. She went to Rio de Janeiro for urban gardens, Manaus for old-world culture, and Brasília for modern architecture. BRASÍLIA – The plans for building Brasília, the new Brazilian capital in the center of the country, date back to 1827 and the reign of Emperor Pedro I. The futuristic city imagined by Italian saint Don Bosco was finally built between 1956 and 1961. 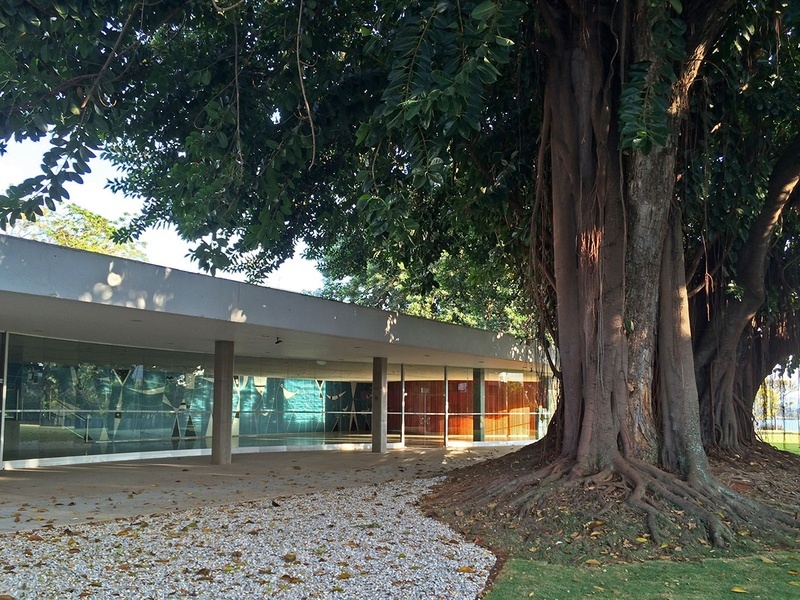 Oscar Niemeyer designed the sterile buildings to fit with Lucio Costa's Communist-influenced urban planning and Roberto Burle Marx designed the landscape with plants from the Amazon and Brazil's Atlantic Forest. Palácio Itamaraty (Esplanada dos Ministérios, Bloco H) is the headquarters of Brazil's Ministry of Foreign Affairs and one of the most magnificent Oscar Niemeyer buildings in Brasília. The reception rooms are big enough to display a 750 square-foot Persian carpet, a gift from Queen Elizabeth II, and make it look like a bath mat. The fountain and terrace and first-floor gardens were designed by Burle Marx, with plants from the Amazon. The view of Brasília from Restaurante Escola. A riff on traditional tiling in Salão Verde. 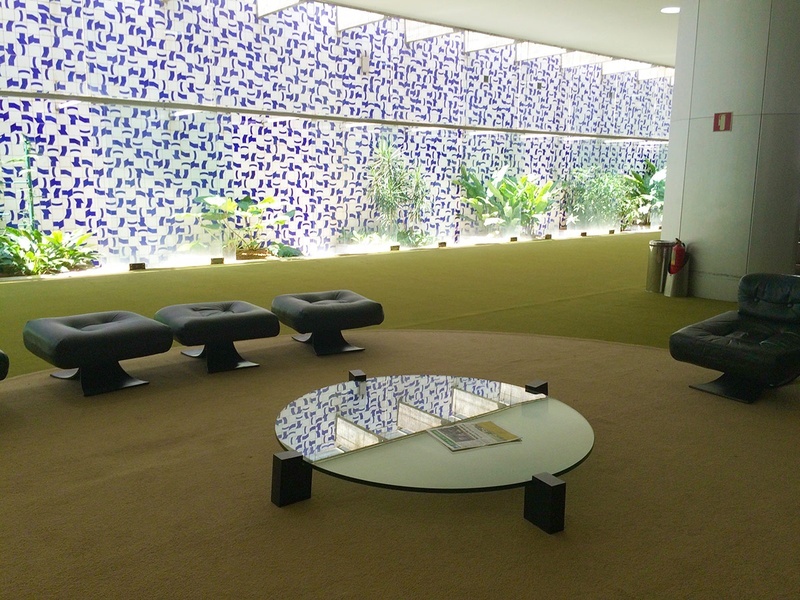 The dynamic blue and white tiled wall in Niemeyer's favorite building, Salão Verde of Congresso Nacional, pays homage to traditional Portuguese tin-glazed tiles.The tile mural by Athos Bulcão, one of Neimeyer's main collaborators in the construction of Brasília, is based on a large design printed on tiles that were then rearranged in no particular order. To see all of Bulcão's murals around Brasília, visit Rota dos Azulejos, organized by Experimente Brasília. If you want your own tile mural, Fundaçao Athos Bulcão takes commissions and ships overseas. Niemeyer's obsession with monumental concrete can get exhausting, especially if you attempt to walk between buildings, which are huge and far apart. While at Congresso Nacional, replenish your energy with a Brazilian buffet at Restaurante Escola (Praça dos Três Poderes, Complexo Administrativo da Câmara dos Deputados, anexo IV, tenth floor; +55-61-3216-9887). In addition to great food, you'll get the best views of the city. 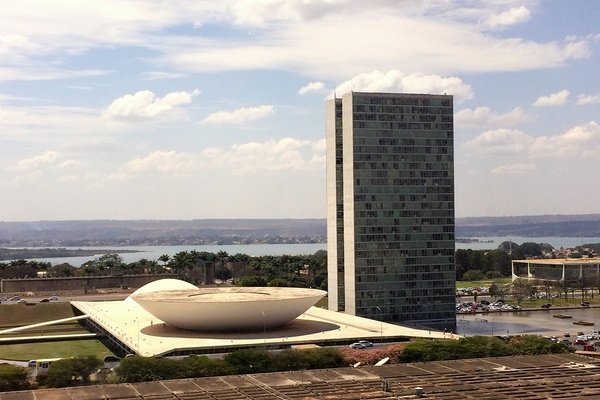 Niemeyer made Le Corbusier (his mentor and his inspiration) proud when he designed the Palácio do Planalto (Praça dos Três Poderes; +55-61-3411-1221), the official workplace of the President of Brazil, with marble columns inspired by fishing boat sails. 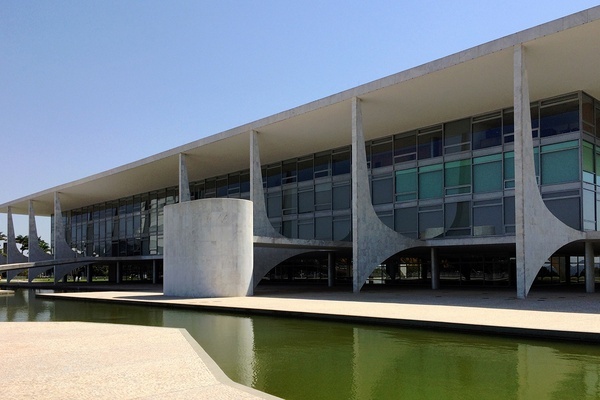 Joaquim Cardoso was the genius engineer who turned Niemeyer's design into concrete reality, literally. The marble columns of Palácio do Planalto. Divine visuals at Santuário Dom Bosco. 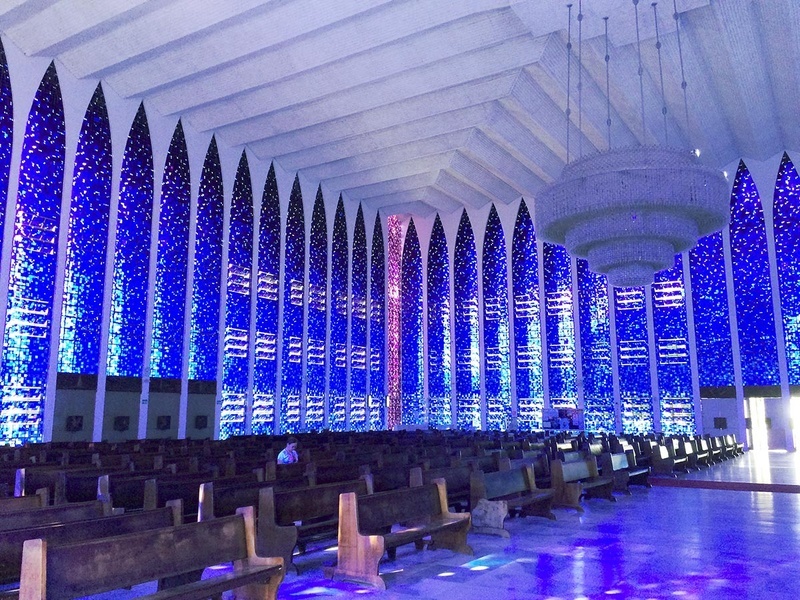 The innocuous exterior does not prepare you for Claudio Neves' stained glass light display that gives Santuário Dom Bosco (Seps 702/902, Lote B, Asa Sul; +55-61-3223-6542) its sense of holiness. When Brasília's impossibly white light filters through more than 100,000 small glass panels in twelve shades of blue, you will want to be a god, or at least a modern version of one, and live here. The church is popular among engaged couples, who wait years to marry here. Brasília Palace, the only hotel in Brasília designed by Niemeyer, is one of the city's first buildings. Opened in 1958, the hotel served as the official residence of President Juscelino Kubitschek until Palácio da Alvoradawas was finished a few months later. After a fire in 1978, Brasília Palace fell into disrepair and was closed until 2006, when real estate magnate Paulo Octavio restored it under Niemeyer's close supervision. 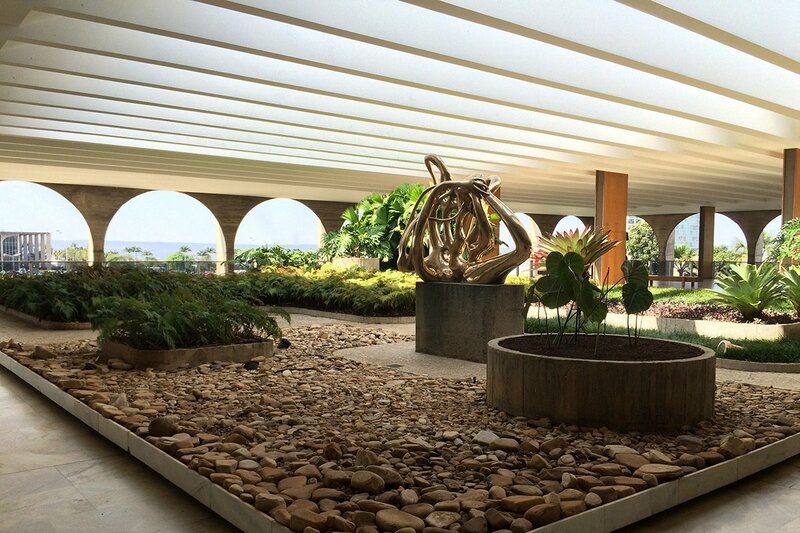 Embodying the best of Brasília's socialist urban planning, the hotel is a respite from the city's concrete, especially during hot months. If you don't stay here, at least book a table for lunch at open-air Oscar restaurant. FLY: Delta flies daily to Brasília–Presidente Juscelino Kubitschek International airport (BSB), a much easier port of entry than Rio de Janeiro or Sao Paulo. Brasília Palace is not just a landmark, but also a great place to relax by the pool under the spotless sky. Building Brasilia by Marcel Gautherot is beautiful book filled with contemporary photography about the building of Brazil's capital city. Paula is a designer and writer living in New York. She travels for the geography and to learn different ways of life across species.